WHY DO VOLUNTEERS HAVE TO COMPLETE THIS? ​In an effort to increase the safety of everyone who is involved in Portage Youth Softball and in following the lead of other youth sports organizations, we are requiring our volunteers to complete a short online concussion education course so that they can recognize the signs and symptoms of concussions as well as necessary precautions needed if a suspected concussion occurs. While this course is directed towards high school athletics, the content is applicable to youth sports. When you submit your volunteer application, you will receive an email with this information. In order to complete this requirement, you need to follow the instructions below. You can click on any of the images below to zoom in on them. The entire course takes 30-40 minutes to complete. 1. Click here to view the course on the NFHS Learn website. 2. 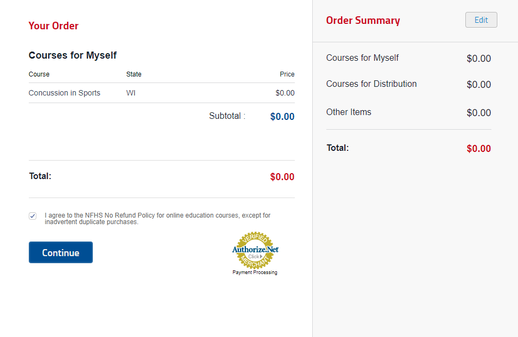 Select " Wisconsin" from the drop-down menu of states and click "Order Course" as shown below. 3. Sign In or Register for a free account when prompted. Complete all required information. If you are not returned to the "Concussion In Sports" course page, complete steps 1 & 2 from above. 4. 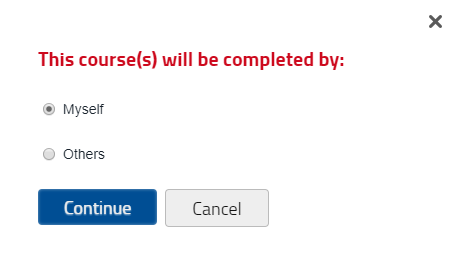 Click "Order Course" again now that you are logged in. 5. When prompted, select "Myself" and then click "Continue" as shown below. 6. 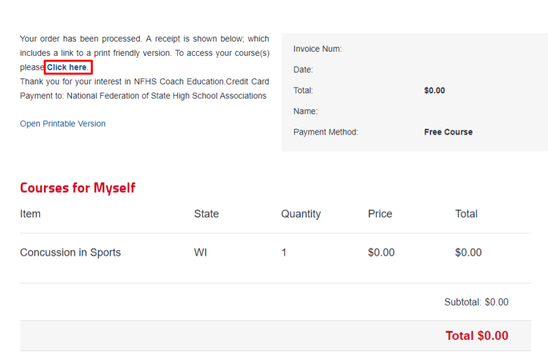 Verify that Wisconsin is still selected and click "Checkout" as shown below. If your shopping cart does not look like the image below, then you have added the wrong course to your shopping cart. If this is this case, begin at step 1 and follow the instructions step by step. ​7. Check the box to indicate that you agree to the NFHS No Refund Policy. Click "Continue" as shown below. ​8. Click "Click Here" as shown below to access your purchased courses. 9. 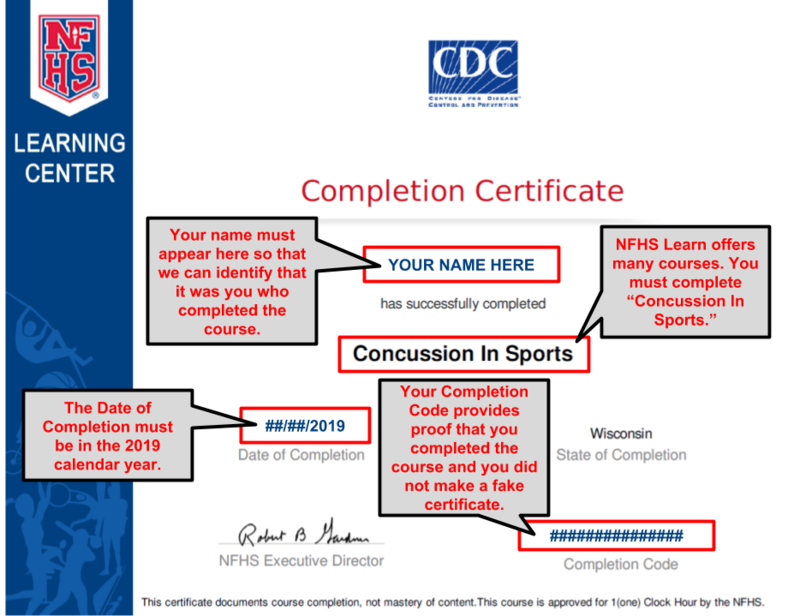 Click "Begin Course" as shown below to start your "Concussion In Sports" online course. If you do not complete the course at one time or wish to view the material after you complete it, log in to your NFHS Learn account, select "Dashboard" and then select "My Courses." ​10. Select the language that you wish to take the course in (English or Spanish) and click "Save" as shown below. ​11. Upon completing the course, click "Download Certificate" as shown below. The information on the certificate will be entered into the form below to inform Portage Youth Softball that you have completed the course. The requirement will be marked as complete on your volunteer application after the information submitted below is verified. ​12. Enter the information shown on your Completion Certificate in the form below. The needed information is shown below. ​You can find all information needed for this form on your Completion Certificate. Please reference the image above for help. Enter the Completion Code from your Completion Certificate. Please ensure that your certificate has a Date of Completion in the 2019 calendar year. Completion Codes from prior years will NOT be accepted.